What is the logo supposed to be? After the long trek from Manila at the wee hours of the morning, my wife and I, together with my parents, finally arrived at our house in Baguio around 10 in the morning. We immediately settled in our stuff, and everyone unanimously agreed (I VEHEMENTLY agreed) that before we go exploring the amazing city that is Baguio, we needed to get some food. We were all eager to get on with our own plans (My mom and Rina wanted to shop at the Ukay Ukay, my dad wanted to get some rest, and I wanted to... well.. eat again) but of course, after a 6 hour road trip, food sounded like a pretty good idea. And since it was a holiday weekend, it would be best to not meet the lunch rush hour head on. 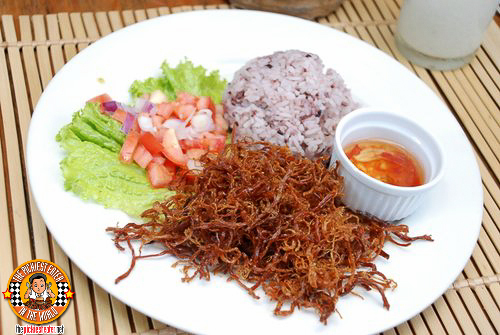 As I had mentioned in my earlier Baguio post, I conducted a small facebook poll to solicit advice from people where to eat when in the City of Pines. Being the picky eater that I am, I was designated by my mom to decide where we'd eat because she wasn't in the mood to get into any debates with me. 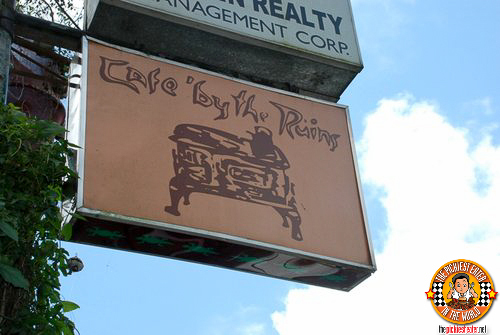 As we pulled out into the main streets of Baguio, within minutes I saw a sign bearing a name that I had heard many times during my facebook poll - Cafe By The Ruins. 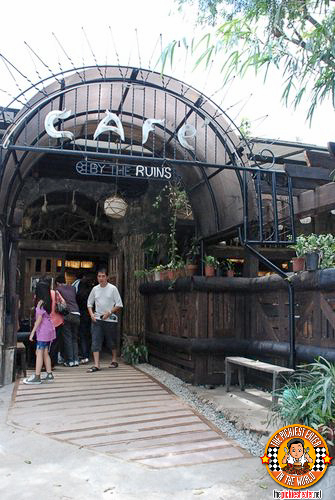 I was quite surprised that Cafe By The Ruins is actually located in the heart of the city. Judging by the name, I had imagined it to be in the outskirts of the forest, against the ruins of some ancient temple or something to that effect. Something Indiana-Jonesy. But it was actually just a few blocks away from a Jollibee hehe. 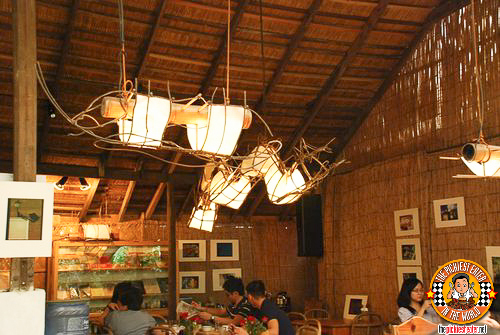 Stepping into Cafe By The Ruins gives you the feeling like you're in a movie set of some sort - the tribal decors, the rattan interiors all come together to form a cozy cafe that imbibes somewhat of a mystical feel to it. Or you can call it an "artsy" vibe. At any rate, when combined with the fresh Baguio air, I could imagine staying all afternoon here to read a (comic?) book or something. The "ruins" in question, is actually the home of Phelps Whitmarsh, the first civil governor of Benguet. The Cafe maintains somewhat of a demolished look to it, without looking dirty or messy. Strangest chandelier i've ever seen in my whole life. My friend Karen told me the story of how she and her fiancee, my buddy Ted, went on a trip together here, and in classic Ted fashion, he sat down and ordered monggo. Karen was a bit baffled, thinking that since it's not every day they go to Baguio, Ted would order something a bit more unique. But her man would not relent. Plain and simply, Ted wanted his monggo. And to this very day, Ted swears, if he ever goes back there any time soon, he wouldn't hesitate to order their Monggo once again. But that's the beauty of Cafe By The Ruins. When you read their menu, it's all dishes that you know you've tried before, but at the same time, it offers a new twist to it. We sat down, studied the menu hard, and decided on what to order. We also ordered the Palawan Chicken (P225), once again giving in to my love for aata, despite the fact I don't usually like coconuts. The chicken was stewed just right so that the meat was very tender, and they place a huge chili pepper on it to add a little heat, but it didn't come on too strong. The sauce was creamy without going sweet, but in all honesty, i wish they drowned it in the stuff, especially for the eaters (like me) who like to drown their rice in their food's sauce. I only have two comments about this dish, and it's not really about the taste, because that part they got nailed. The first was the (lack of) sauce, and the second, was the size of the chicken. When you put what seems like a giant mutant chili pepper as a garnish, you better make sure your chicken is huge as well, otherwise, its going to look like "Palawan Sili" instead of "Palawan Chicken". 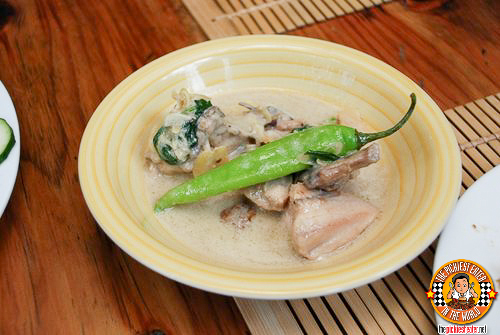 My dad ordered the Pinikpikan (P210), which was sort of like a chicken soup dish in the mold of tinola and sinigang. The flavors of the vegetables burst with every sip of the soup though maybe i might have asked to turned down the sourness just a little bit, and I liked how they used a quarter leg of the chicken, instead of throwing in some random white meat parts (like what I think they did with the Palawan Chicken) According to the menu, the soup also contains "eteg", which is Salted Pork. Since it was already mixed in the soup, I really wasn't able to appreciate what "eteg" was, so i can't honestly say if it was good or not. 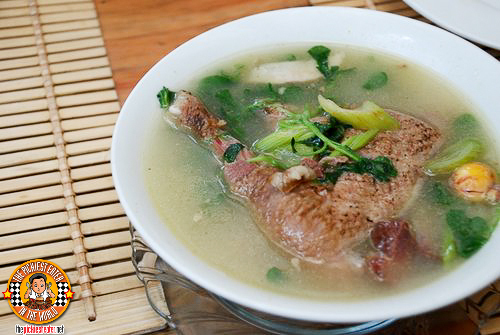 But in terms of a hearty soup that can most definitely get you full, the Pinikpinakan hit the spot. For some reason that I can't comprehend, I didn't try their Ole Nick's Open Faced Tuna Sandwich. And that is something I'm regretting to this very day. It sounded like a Croque Monsieur fried in tons of butter! (I love tons of butter!!) They must have said the word "Butter" at least three times in the menu description! If I ever had a "soul mate sandwich", this one would definitely be in the running. haha sorry! That's the whole point of the blog! These pictures look great, we love seeing the types of food eaten in different cultures around the world, even if the rice is purple!